The SER-485 Mini is a small size, smart bidirectional RS232 to RS422/RS485 converter that is fully configurable by software and suitable for industrial environments. The device supports the ARTc (Automatic Receive/Transmit Control) for RS485 and auto baud rate sensing. Whilst automatic line termination exists there is no need for biasing differential lines easing its deployment. 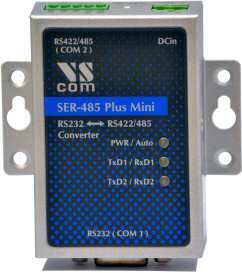 Both the RS232 and the RS422/RS485 interfaces are ESD surge protected. RS485/RS422 interface is build as a 5 Pin terminal block. The device is a table, Din-Rail or wall mountable system. In the RS485 mode, the data direction is managed by the bitrate adaptive function of the ARTc to allow faster transmitter switch-off times. Auto baud rate sensing analyses the data in real-time and adapts to the speed of the RS232 port; this way the change from transmit to receive is done quickly and automatically. All options and parameters of the SER-485 operation are configured by a software and controlled by an easy-to-use menu structure. This menu is accessed from standard terminal programs. The SER-485 has NO jumpers. Operation modes that are frequently used by the RS485/RS422 are selected by bottom DIP switches. The full versatility is controlled by the built-in software configuration menu. The internal termination resistors help to adjust the RS485 signals to connect to customers networks. These internal resistors are controlled by the configuration modes. For usage in hazardous industrial environments, the RS232 & RS422/RS422 interfaces and DCin are +/-16KV air and +/-8KV contact ESD surge protected. 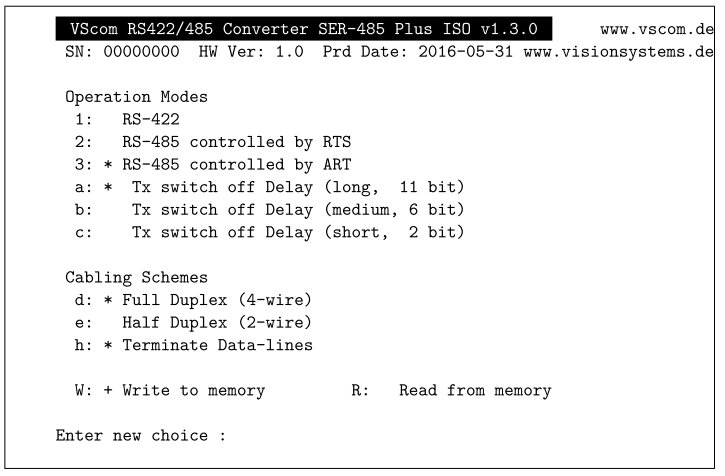 Long distance RS485/RS422 connections with unbalanced ground loops could seriously damage the equipment; As such, an ISO version offers 2.5kV galvanic isolation.